This security poster illustrates the TM-62P & TM-62P3 Russian Anti-Tank Mines. These anti-tank mines are in a series of “TM-62” series mines. The mines are two similar sized versions, one using a Bakelite body whilst the other has a thin cased plastic body. When fitted with the MWP-62 fuze, the anti-tank mine is described as a minimum metal version. These mines can be fitted with a variety of fuzes common to the TM-62 series of mines. 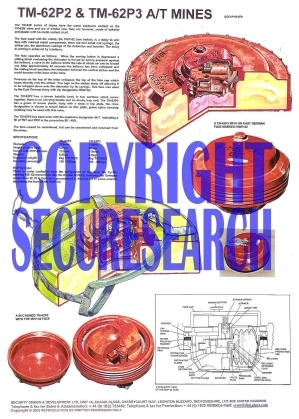 This security poster features a sectioned TM-62P3 with the MVP-62 fuze, a schematic view of the MVP-62 fuze, and a TM-62P2 with an East German fuze marked MWP-62. This security poster also shows the TM-62P & TM-62P3 Russian anti-tank mines’ specifications and the MVP-62 fuze. A TM-62P2 with an East German fuze marked MWP-62. A sectioned TM-62P3 with the MVP-62 fuze. A schematic view of the MVP-62 fuze. The TM-62P & TM-62P3 Russian anti-tank mines’ specifications and the MVP-62 fuze. This security poster features the TM-62P & TM-62P3 Russian anti-tank mines' specifications and the MVP-62 fuze, a sectioned TM-62P3 with the MVP-62 fuze, a schematic view of the MVP-62 fuze, and a TM-62P2 with an East German fuze marked MWP-62.